This beautiful Hardanger needlecase is based on traditional-style Hardanger designs, with colour added for contemporary style. Traditionally, Hardangersøm (or embroidery from Hardanger) was worked in white thread on white linen. It was worked in long bands, and did not use the buttonhole edge that is so frequently seen on contemporary Hardanger. The stitches used in this project are traditional Hardanger stitches: satin stitch, four-sided stitch, needleweaving, dove's eye filling stitch and cable stitch. The embroidery stretches around the front and back of the needlecase. The needlecase has two pockets inside for holding needle packets, needle threaders, small cards of thread, and even scissors. The needles themselves are stored on doctor's flannel to reduce needle rust. 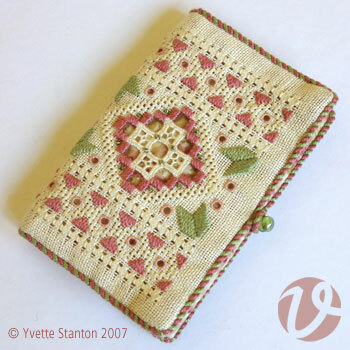 This pattern features detailed step-by-step instructions, with accompanying diagrams. Worked on 25 count linen, with pearl cotton.